If you’re staying in to avoid the crowds or weather, we have some great tips for transforming your dull home into a warm, romantic retreat. Whether it’s Valentine’s Day, date night, or just a way to treat yourself, there are plenty of ways you can get warm and comfortable without touching the thermostat. Things like cooking a hot meal, starting a fire, and snuggling under a blanket aren’t just easy, cheap ways to stay warm, they’re also extremely romantic and foster loving and caring relationships. Cooking a warm pot of soup, chili, or another steaming hot meal will not only heat up your home, it will also heat up your belly and body temperature. Additionally, the hot, simmering meals introduce much-needed humidity to the dry, winter air. Hot drinks and food create warmth in your body and soul. Don’t forget about hot chocolate and other warming drinks! If you are cooking or baking something in the oven, don’t forget to leave the door open after the meal is finished cooking. Although taking advantage of heat that is already there is a great way to add some extra heat to your home, NEVER use the oven to heat your home. Make sure the oven is off if you leave the door open. Besides the frightening carbon monoxide risks, heating your home with the oven is extremely inefficient and will cost you far more in energy costs than running the HVAC system. We all know that preserving body heat is a great way to stay warm, but few adults think of blanket and pillow forts. Valentine’s Day and other winter holidays are a great time to bring back that childhood passion and creativity of yore. And you’ll stay nice and toasty without having to turn up the heat. Gather all the warmest and fuzziest blankets and pillows you can and make a little snuggle site. Cuddling in a warm blanket fort is not only romantic, it’s comfortable and relaxing. Just because you’re an adult doesn’t mean that you can’t tap into that childhood creativity and build an adult version that fits your current tastes. If it’s your first time, learn how how to create a blanket fort from WikiHow. The inside of your fort should be as comfortable as possible. Think stuffed animals, sheets, pillows, blankets, cushions, and towels. You can also add entertainment like laptops, tablets, small tables, books, and magazines. Keep hard and sharp things out. Consider adding a sleeping bag or two in your blanket fort. They are better insulated and can give you the impression that you are camping. It doesn’t get much better than cuddling up on the couch watching your favorite movie or television show. To crank up the heat, we recommend grabbing your most comfortable blankets, hot cocoa, candles, and lighting the fireplace if you have one. Dim the lights (if you don’t have dimmers, contact an electrician) and consider adding some candles and string lights. Learn about the 3 layers of indoor lighting. Keep a 1-foot radius around all candles at all times. Only use candles on flat, level surfaces. Keep candles away from edges and places where they can be knocked or kicked over. Blow out all candles before you leave the room or go to sleep. Do NOT put any candles in your blanket fort! Consider battery-operated candles so you can spend more time relaxing instead of worrying over worst case scenarios. If you are experiencing any problems with your lights or electrical system, read about common winter electrical problems and how to avoid them. If you’re one of the lucky ones with large bath, don’t take it for granted. End the romantic evening with a beautiful bubble bath. Fill the tub with hot water and a concoction of your choice (salt, oil, lavender, bubbles, etc.). Lead the way with rose pedals if you want. The heat, combined with the steam, will create a luscious and steamy atmosphere. If the bath is still warm when you are finished, don’t drain it right away. Take advantage of the heat and steam by allowing it to sit until it releases most of its heat and humidity. You probably have plenty of blankets to keep you warm, but nothing is better than entering an already-warm bed. To do this, simply grab your heating pad, hot water bottle, or microwavable heat pack and place it in between the sheets. Who doesn’t want to climb into a warm and toasty bed? Do not use if you notice any damage, such as cracked and frayed cords. Do not fold them when in use. Do not leave on while unattended. Do not use while sleeping. 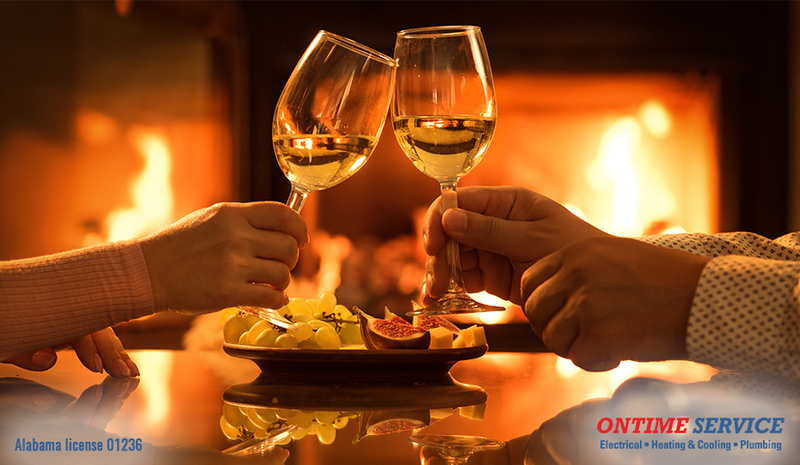 The next time you’re thinking about going out, remember how easy it is to create a romantic evening at home. Of course, you need all the most important elements in safe, working condition. Contact OnTime Service to find and fix any HVAC, electrical, or plumbing problems you may have.